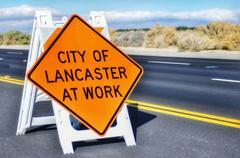 Intermittent lane closures on 25th Street West between Avenue K and Avenue K-8 from November 5, 2018 through November 16, 2018 due to City of Lancaster Pavement Management Program (Revive 25). The scope of work includes asphalt milling and pavement overlay. Northbound 10th Street West at Oldfield Street. Northbound 10th Street West at Lancaster Blvd. (AM/PM alleyway driveway). The alley South of AM/PM will be closed. Northbound and Southbound 10th Street West between Avenue H-8 and Avenue I. Westbound on Avenue L between 15th Street and 17th Street West.